Insect hovering is a remarkable phenomenon and MAVs (micro aerial vehicles) mimicking their dynamics are desirable due to their enhanced manoeuvrability capability and miniaturisation potential. 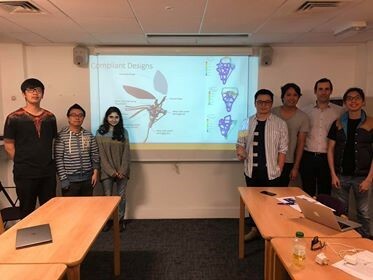 Our project aims to design flapping wing MAVs (micro aerial vehicles) with the eventual aim to achieve a stable hovering condition, as well as model and combine the individual aspects (transmission system, wings, flexural hinge) to enable optimisation. We created stage one prototypes which can be used to generate empirical data by changing design parameters, such as wing geometries and structure, transmission link or complaint beam lengths or motor rotational speeds to identify possible operating conditions or correlations and which can be used to improve the models and progress towards the aim. 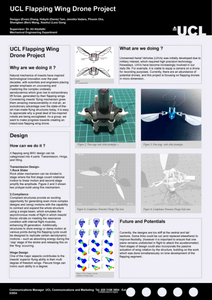 Our designs explored different transmission mechanisms (such as a four-bar crank design, 5-bar geared mechanism to generate a lemniscates wing trajectory and compliant structures), as well as control methods and rotation inducing features (flexures) to emulate the kinematics of insect flight. We managed to achieve flapping with different transmission systems, as well as some empirical data which enabled us to find correlations for the four-bar crank-rocker system; the main testing results showed deformable wings achieved around 1/5th of the lift generation compared to rigid wings of the same size and venous structure (approx. 1gN as opposed to 5gN). These can be used by future teams to derive more data.